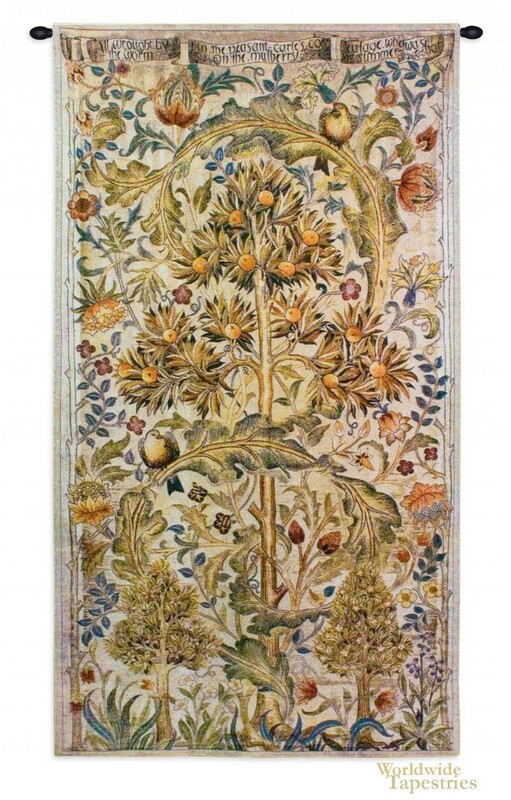 This tapestry "Summer Quince" is based on the work of William Morris and Co. The works of William Morris contain beautiful motifs from nature and is related to his artistic aspirations to revive the art of testiles and tapestry making by introducing beautiful designs into art and decor in an increasing industrial age. Here we see the acanthus leaves in a beautiful arching formation, which is a signature of Morris' pieces. As well, he includes the quince tree, a deciduous tree that bears beautiful flowers and the quince fruit. Spread throughout are also a variety of leaves, buds and flowers to create a visually cohesive and detailed design to allure the sense. His use of color is masterful as the orange and greens compliments the beiges and light greys perfectly. His Victorian design company produced high quality pieces including over a hundred tapestry designs and inspired a whole new movement of decorative arts. His hallmark motifs and use of harmonious color is evident here in this work. This tapestry "Summer Quince" is backed with lining and tunnel for ease of hanging. Tapestry rod and tassels where pictured, are not included. Dimensions: W 35" x H 68"